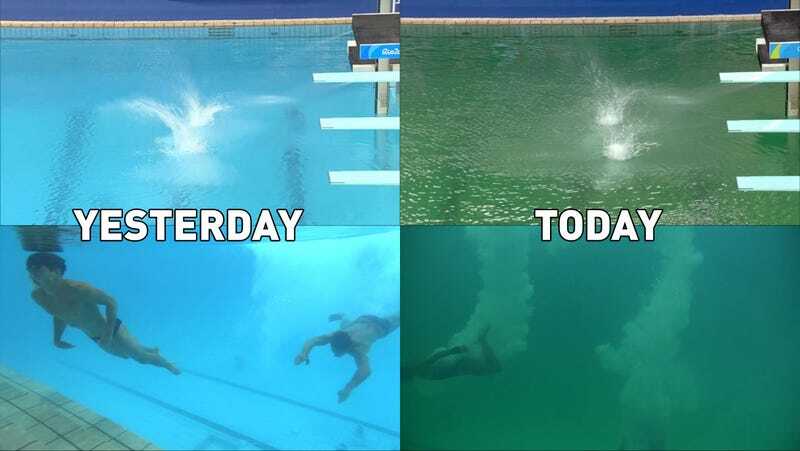 The water at the Olympics diving pool in Rio looked lovely and clear for yesterday’s men’s synchronized event. It looks less lovely for the women today, owing to what we believe is an algae takeover. While algae itself is generally harmless, the conditions that allow it to grow—deficient levels of chlorine, most likely—might give pause to competitors considering the antibiotics-resistant superbacteria that were detected at Olympics venues before the Games began. There are still ten more days of diving competition in Rio. Stay safe, athletes!